Child-friendly? A claymation-style comedy about a group of oddball pirates traveling the high seas in search of treasure, adventure and good times? The Pirates! Band of Misfits has child-friendly written all over it. I actually love watching a well-written, hilarious children's film with my family – they're just so hard to come by. Luckily, The Pirates! Band of Misfits is one of those rare treasures that had me doubled over in laughter from start to finish, and I may have even appreciated the flick's sly humor more than my kids. And in an age where children's movies and television are almost solely computer-generated – often appearing to have been put together in less than a week – it's refreshing to see the classic stop-motion style of animation dusted off for a contemporary audience. But enough of my fawning, let's get to the story. Directed by Peter Lord (who also brought us Chicken Run in 2000), The Pirates! 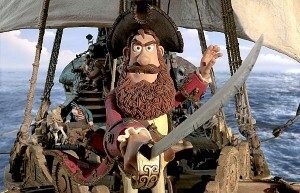 Band of Misfits follows the misadventures of The Pirate Captain (Hugh Grant's first animated role) and his bumbling crew of salty dogs as they cruise the oceans in search of plunder. Despite the Pirate Captain's unbridled enthusiasm for his chosen career, his raids often end in hilarious disaster – such as attempting to board an ethereal ghost ship. All of the Pirate Captain's seafaring ways are an effort to win the coveted Pirate of the Year award while showing up his buccaneer rivals, Black Bellamy (Jeremy Piven) and Cutlass Liz (Salma Hayek, who recently lent her voice to the animated flick Puss in Boots. Here's to hoping we see her in a live-action film sometime soon). While attempting to rally his crew in advance of the award, the Pirate Captain coincidentally boards a vessel known as the H.M.S. Beagle – transporting one Charles Darwin (David Tennant). As the crew attempts to raid the ship, Darwin informs them that their parrot Polly is in fact the very last dodo bird in existence. With this incredible discovery, the pirates and Darwin return to England to present their findings – however they are uncovered by the pirate-hating Queen Victoria – jeopardizing the Pirate Captain's chances at winning Pirate of the Year. Between a sarcastic monkey, bumbling Captain, snarky crew members and a bevy of famously hilarious English voice actors, this is a film the whole family can be excited about. Swashbuckling hasn't been this thrilling since that little-known Johnny Depp movie was released six years ago. Child-friendly? With subtle nods to adult humor layered on top of classic slapstick hilarity, The Pirates! Band of Misfits delivers the goods for children and parents alike. Recommended for ages 5 and up.